Sad news reported in the West Seattle blog: Hussein Khazaal, owner of Alki’s popular Phoenecia restaurant, died unexpectedly on Saturday. Khazaal’s family — and those of us who knew the man and his restaurant — mourn his loss. 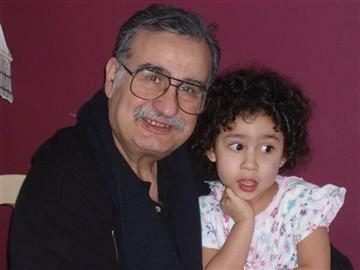 Hussein Khazaal, with his granddaughter Laylah (Khazaal family photo). As I wrote in a P.I. review in 1997: The original Phoenecia “opened on West Seattle’s California Avenue in 1973, introducing ambitious diners to the then-exotic joys of eggplant and tahini. Word spread like hummus on warm pita, as did the reputation of the Lebanese chef who ran a one-man show and gained a loyal following.” In 1980, Khaazal relocated his restaurant to the Hansen Bakery complex on lower Queen Anne, where his Mediterranean cuisine garnered further attention. And in 1992 he moved again, back to West Seattle, across from Alki Beach where he continued to charm and delight his regulars until his passing. This morning, West Seattle lost one of its finest residents. Hussein Khazaal, my father and best friend, passed away in his sleep of natural causes. While this loss is devastating to our family, we know how much he meant to the community as well. Words cannot express the sorrow in our hearts in losing someone to whom we were so close. He was far too young to die but we are grateful he went peacefully. Dad lived for his family, which included his patrons. The restaurant along, with his wife, children and grandchildren, were everything to him. Anyone who ever had the pleasure of knowing him can vouch for me when I say, he never had a selfish moment in his life. You, our dearest customers, were what made him happy. The looks on your faces as he took you to paradise with his culinary masterpieces brought him great pride and joy. We thank you for indulging him and letting him “prepare something special” for you. We are not sure where we will go from here. There is a possibility we will reopen Phoenicia. We are confident we can prepare the food; we are just not sure how we have it in us to run the business he built without him by our side or if we can provide the same magical atmosphere our beloved Hussein did. Our decision will take time, thought and discussion. Regardless of the fate of Phoenicia, we know Hussein will live on. Whenever one person performs an act of kindness to another, Hussein lives on. Wherever there is generosity, Hussein lives on. Wherever there is beauty in the simplest of things, Hussein lives on. A memorial will be held within the week. We have not yet determined the location. However, if you would like to attend, you may e-mail me at wkazaal@hotmail.com and I will send you information regarding the time and place. Lastly, if you are wondering if there is anything you can do for us … there is. If you have any warm thoughts or stories you would like to share with us about Hussein or Phoenicia, please e-mail them to me at wkhazaal@hotmail.com. Your words will be of great comfort to our family. We will be in touch soon regarding our decision as to the fate of Phoenicia. Till then we thank you so much for your patronage over the years, as did Hussein. We consider you part of our family. Thank you. Hussein Khazaal’s burial service will be held tomorrow (Tuesday, August 11) at noon at the House of Mercy All-Muslim Cemetery, 15004 S.E. 256th Street in Covington. A celebration of his life is scheduled for Friday, August 14 at 6:30 p.m. on the Alki beachfront across from the Phoenecia, between the Statue of Liberty and the Alki Bathhouse. His family welcomes all comers.